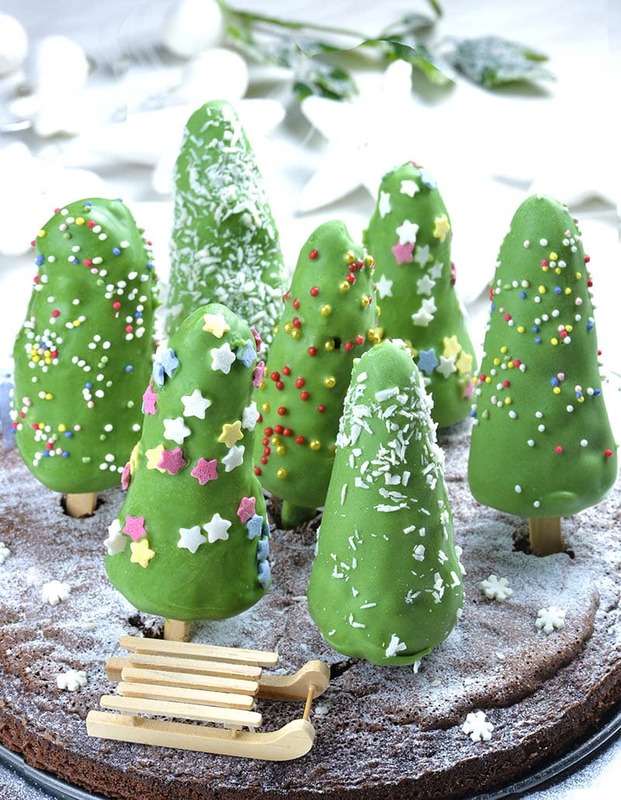 Christmas Tree Cheesecake on a stick is festive and fabulous Christmas treat. Eating cheesecake has never been this fun! Mini cheesecakes in the shape of Christmas tree, overload with candy bars are perfect Christmas party dessert! Mini Christmas Tree Cheesecakes are cute and festive individual portions of cheesecake. And they are soooo DELICIOUS!!! 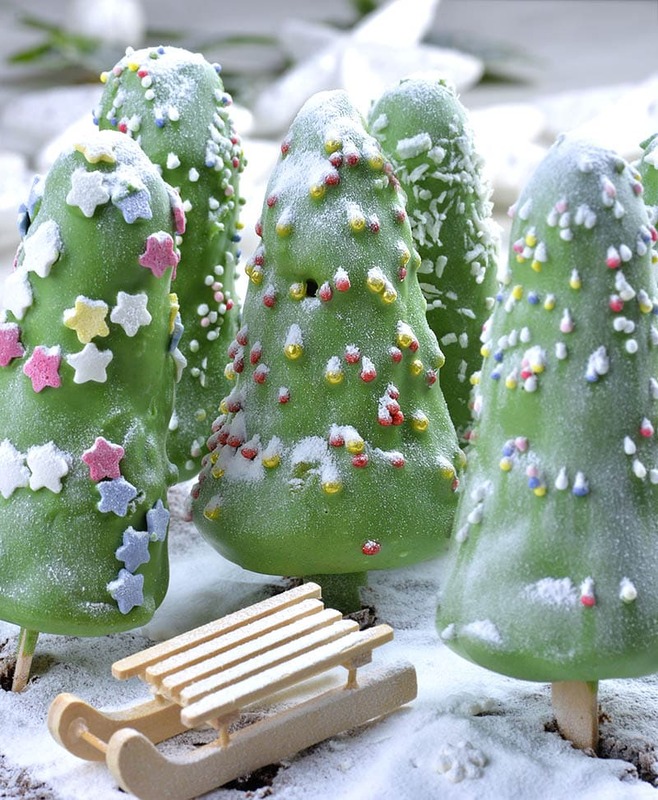 However, these adorable little Christmas trees hide delicious surprise inside, too. They are loaded with pieces of milk chocolate candy bars: Snickers, Milky Way, Almond Joy, Maltesers, Mars…But, you can use other candy bars, too. Pick your favorites. Maybe you’ve tried cheesecake on a stick. It’s literally slices of cheesecake on a stick dipped in melted chocolate. Since it’s Christmas season, I wanted to make something really special and fun! So I could not be satisfied with cheesecake slices covered with chocolate. I wanted to make perfect winter wonderland. Therefore, my Christmas trees had to be in perfect cone shape. But, I didn’t have a mold for that. So, I had to try to bake them in an ice cream cone. And it worked better than I expected! It was a time consuming, but it was totally worth it! Actually, it takes a lot of time for me because I tried to find the way to make the ice cream cones stands still when I filled them with cheesecake mixture and place them in the oven. But now, when I found the way, making these Christmas tree cheesecakes next time will be a breeze. How to bake mini cheesecake in ice cream cones? First, you’ll have to line the inside of ice cream cones with parchment or baking paper. Cut rectangles of parchment paper, make the cone and place it inside the ice cream cone. Trim the excess of paper, leaving it ¾ inch above the ice cream cone. To secure the cone stand still when stick them in the wire rack for baking, I suggest using aluminum baking cups inverted upside down and poke the bottom in the center with a sharp knife. Pull out the wire rack from the oven, then place oven rack on top of any baking pan ( it has a purpose to hold the rack until you transfer it back in the oven). Arrange inverted aluminum cups on the rack. Make sure that parchment paper completely covers the inside of each cone and that there are no gaps. Then divide cheesecake mixture in each cone lined with parchment paper. Now, stuck the ice cream cone in the center of aluminum cups and push it gently until it stands still. When the cones are filled, gently lift the rack and place in the oven. When the cheesecakes are done stuck wooden stick in the center of each cone. Cool to a room temperature in the cones. Then gently pull out each cheesecake from the ice cream cone. Arrange on a tray ad freeze for a few hours. When ready for dipping in candy melts, gently peel off the parchment paper. Eating cheesecake has never been this fun! 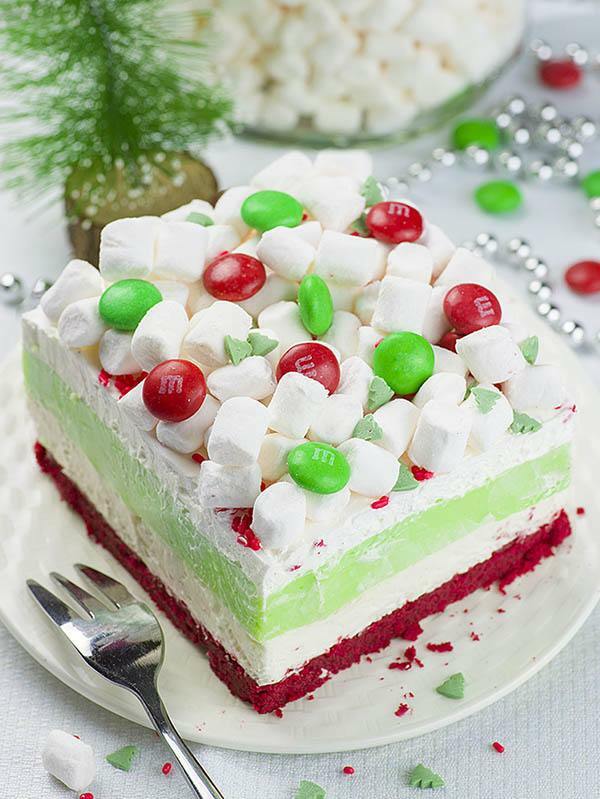 Mini cheesecakes in the shape of Christmas tree, overload with candy bars are perfect Christmas party dessert. Pull out the wire rack from the oven, then preheat the oven to 325 F.
Beat softened cream cheese until light and creamy. Add sugar and mix until sugar dissolves and the mixture are creamy and smooth. Mix in salt, vanilla and corn starch. Add slightly beaten egg and mix just to combine. Mix in sour cream. How to assemble the cones? Cut 6 (8 x 5.5 inches) rectangles of parchment paper. Make the cone from parchment paper and place it inside the ice cream cone. Trim the excess of paper, leaving it ¾ inch above the ice cream cone. Place oven rack on top of baking pan. To secure the cone stand still when stick them in the wire rack for baking, take aluminum baking cups and poke the bottom in the center with a sharp knife. Arrange inverted aluminum cups on the rack. Make sure that parchment paper completely covers the inside of each cone and that there are no gaps. Then pour 2 teaspoons of plain cheesecake mixture in each cone lined with parchment paper. Now stuck the ice cream cone in the center of aluminum cups and push it gently until it stands still. Divide cheesecake mixture with chocolate candies between the ice cream cones. Gently push it with the spoon to make sure there are no empty gaps. Top with remaining plain cheesecake mixture. Fill to the top of ice cream cones. Gently lift the rack and place in the oven. Bake 30-35 minutes until the tops are firm to the touch. Cool to a room temperature in the cones. Then gently pull out each cheesecake from the ice cream cone. Arrange on a tray ad freeze for a few hours. When ready for dipping in candy melts, gently peel off the parchment paper. Prepare candy melts according to package directions. Pour in a tall glass. 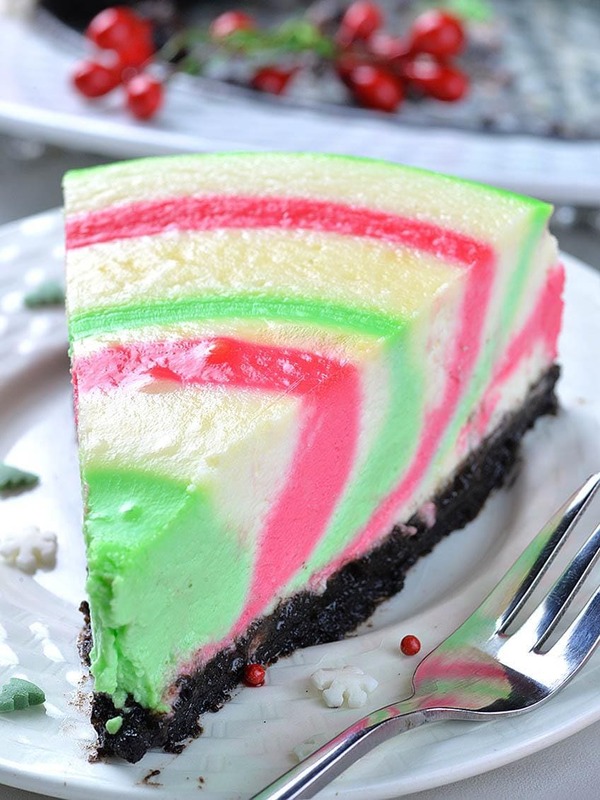 Dip each cheesecake in candy melts and garnish with sprinkles immediately. Candy melts will set fast because the cheesecakes are frozen so sprinkle it quickly. Place on tray to set. Store in the fridge for 3-4 days or freeze for longer storage. 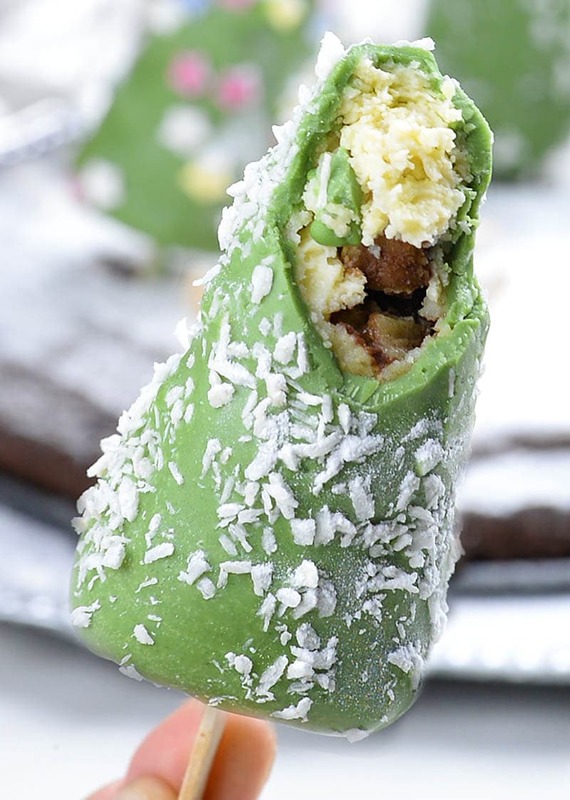 *You can layer chopped candies alternately with plain cheesecake mixture directly in the cone (like I did in the video). But, that way I get a few empty gaps that doesn’t look too nice and the cheesecake tend to brake at that point, so I had to push it back to stick together. I suggest you to stir chopped candies in cheesecake mixture, then fill he cones. **You can serve these cheesecakes laid on a tray. I baked fudge brownies in a round cake pan and use them as a base for my Christmas trees. 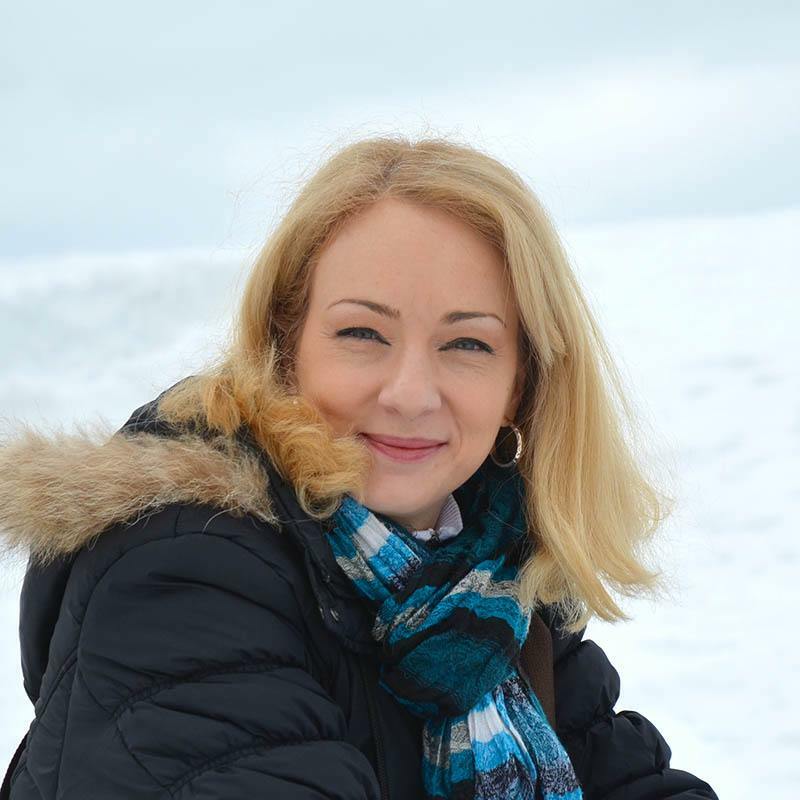 Dust with powdered sugar before to make snowy effect if desired. I thought they would be left in the sugar cone! Would that not work? Did the cones get burned in the oven? A crunch might be nice. What a creative idea! They look perfect for Christmas! Haven’t see dessert so creative for quite a long time 🙂 Marry Christmas !